We Shall Not Be Moved recounts the fervor, zeal, and inspiration black churches provided the American Civil Rights Movement, showing the spiritual component often left out of the telling of that great story. Much like their pastoral counterparts of the American Revolutionary War era, black pastors came to the forefront during the struggle in southern states during the 1960s to lead their race in battles against injustice. 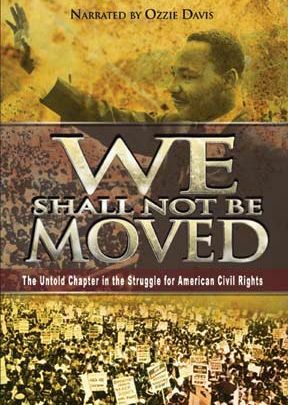 “We Shall Not Be Moved” tells us the names of the famous and not-so-famous, and gives the best character analysis of Rev. Dr. Martin Luther King, Jr. that I've ever heard. The video is backed by offers excellent research. Filming was done on location, which means that you’ll see where events happened. You’ll “be there” and have the opportunity to meet the men and women who made it happen, experiencing what you might have been too young to understand at the time. Narrated by Ossie Davis, the 90-minute tape is documentary one moment, and living room chat the next. This style lends warmth and life to the subject, combining well with the spiritual and historical context of the narrative. While viewing this video, your emotions will run from shock to shame, then on to amazement, pride, and gratitude. This beautiful documentary is narrated by the late Ossie Davis. It examines the American civil rights movement from the perspective of African- American churches. Using the testimonies of pastors, activist, church members and other participants from four churches, We Shall Not Be Moved recalls events from a historical perspective. The churches serve as spiritual and moral support centers and show God's presence in a way the news media ever could. Highly recommended as an addition to any library. Very well done. A documentary you can watch several times. Lengthy on location scenes very educational and well researched. We were so surprised to hear the interviews with people from the 1960's who were with Dr. King and the churches. A great story of how congregations in one city knew well the congreations in the rest of the city.